Hi there, and thanks for stopping by on our visit to Fort Jefferson, Dry Tortugas, National Park, Florida Keys. One of our homes away from home is the Florida Keys. My parents have lived there for over ten years and we spend as much time as we can there (when we are not overseas because of my husband’s basketball contracts.) One of our favorite day trips is to Dry Tortugas National Park. Fort Jefferson, in the Dry Tortugas is one of the most remote parks in the national park system. It is 70 miles west of Key West and is only accessible by boat or seaplane. The park itself is about 100 square miles, most of it is open water, with seven small islands. Since the only way to get there is by boat or seaplane, you need to take a boat via tour; we went with a catamaran out to the island. You can go by boat or include a tour of the island as well. I would suggest taking the guided tour of the island and the fort, as well there is so much to see. The boats leave daily from the marina in Key West, near the tourist information center. The guides are great and informative. We learned so much from our trip! Compare Prices to the Dry Tortugas here. 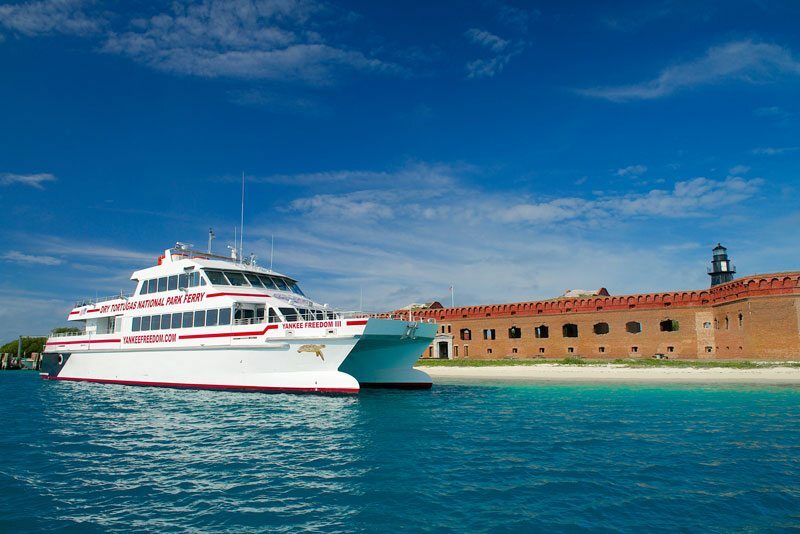 The ride out to the Fort Jefferson is about two hours and fifteen minutes, so sit back, relax, and enjoy the trip! The boats have clean bathrooms, a great crew, an open sun deck, and an enclosed seating area for the ride. Rumor has it that Ponce caught over 100 turtles while he was there. Today, no catching the turtles, please! The islands are also home to three different kids of turtles – loggerhead, hawksbill, and green turtles. They return and lay their eggs on the islands. If you see a nest, don’t touch it. The island was named “dry” because it lacked fresh water, so “dry” was later added to the name to warn sailors that there was no fresh water on the island! When you get to the island, you will see this massive structure with a moat all the way around it. This is Fort Jefferson. In the beginning of 1825, five years after Spain sold Florida to the USA, the U.S. Navy sent someone to investigate the Islands of the Dry Tortugas. The U.S. Navy was looking to build a base to help control the pirate ships coming from the Caribbean. Fun Fact: The fort took over 30 years to build and 16 million bricks! Fun Fact: Look around as you are walking through the park. J.N.O Nolan was a bricklayer and helped build the fort. He carved his name in many bricks around the fort. 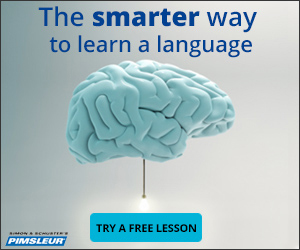 See how many you can find! This fun fact was supplied by Yankee Freedom. At Fort Jefferson, they had over 420 heavy guns, and some of the cannons are still there today. You will see them as you walk around. There were barracks, or living quarters, for the soldiers, and a large building to store the gun powder. Download the attached map and see if you can find all the old buildings – dry-tortugas-fort-tour-map. During the Civil War, the fort was used as a prison. Most of the prisoners were military men who deserted during the war; however, there was one very famous prisoner held there – Dr. Samuel Mudd. Dr. Mudd was the doctor who fixed the broken leg of Mr. John Wilkes Booth, the man charged with assassinating Abraham Lincoln in April of 1865. In 1867, yellow fever hit Fort Jefferson. Many of the prisoners and soldiers got sick and/or died. Dr. Mudd helped treat and save many lives, even though he was a prisoner and did not have to help the soldiers. For his help against yellow fever, President Johnson signed a pardon for Dr. Mudd and he was released on March 8, 1869. The island is home to some amazing beaches. Don’t forget your suit and snorkel gear. The water is so clear that you can see down to the bottom. Please do not touch the reef or disturb anything in the water while you are snorkeling; it destroys it. You might see that some sea anemone have tentacles that are triggered by the slightest touch. Once the tentacle is touched, the anemone fires a harpoon-like fiber into their victim. The fiber injects the fish with a paralyzing neurotoxin. Once the fish is helpless, it is put into the mouth of the anemone by the tentacles. Fun Fact: Did you know that clown fish are the only fish who are not affected by the sting of the sea anemone? They have a coating on their skin that makes them immune to the sting. The animal life there is amazing, so take some time to walk along the sea wall; you might spot a friendly octopus hanging out. We were lucky enough to catch the Yankee Freedom’s captain taking a walk along the sea wall. He was nice enough to point out many different kinds of fish and showed the boys an octopus that he says hangs out there all the time! Fun Fact: A female loggerhead sea turtle may travel thousands of miles to return to the beach, where she was hatched as a baby, just to lay her own eggs as an adult. I hope you had a wonderful day at Fort Jefferson Dry Tortugas with us. Get some sun, see some history, and check out the amazing wildlife. Lastly, for the kids, you can also become a park ranger for the day! You must either download the ranger handbook and take it with you or you can pick one up at the visitor’s center on the island. If you abide by all the rules of the handbook while visiting, you will receive your park ranger badge. My kids both received theirs! You can download the handbook here – junior-ranger-handbook. Can we help you with anything else in the Florida Keys? The Key West walking and food tour, the Key West party sunset cruise, and take the Key West snorkel and dolphin cruise. Those are our personal favorites! If you are looking for a family-friendly sunset cruise, check out the Key West glass-bottom boat trip. Check out the best hotel deals in the Florida Keys with Booking.com or Trip Advisor. My personal recommendation is Ocean Key Resort. It’s gorgeous with an ocean-front pool, pool bar, and a spectacular restaurant, walking distance to all the great sights of historic Key West. If you need a family hotel, or apartment with a kitchen, my suggestion is – Villas Key West. They have full kitchens, a pool, and plenty of room for a family. Looking for flights to Key West? Check out JetRadar to get the best prices and routes to the Keys. You can fly into Key West, or you can also fly into Miami, rent a car, and drive down to the Keys; the view is beautiful. We do this often, as the flights are usually cheaper. Our go-to travel company for one-stop options for flights, car rental comparisons, and hotel packages, when traveling to the USA, is Expedia.com. 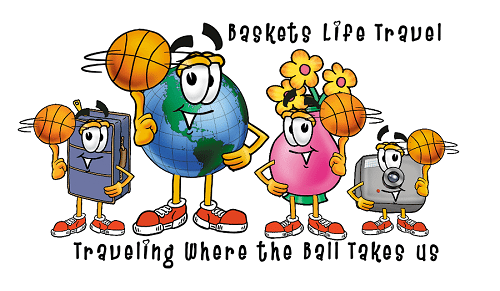 Baskets Life Travel is often given tours, accommodations, or travel perks in exchange for writing reviews or information about certain travel destinations; however, all reviews are written without bias and are our own opinions. Some photos were provided by the Yankee Freedom and the Dry Tortugas National Parks. Nice blog and awesome Florida. I just booked that exact tour on Viator a couple of days ago! I'm so excited for the trip. I have heard nothing but great things about it. Awesome article! Feel like im right there with ya! Just did a post on best things to do in the florida keys today and included the dry tortugas np! Thank you very much for reading the Dry Tortugas is amazing ~ its a pretty easy write when its such an amazing palce! Wow. What an amazingly informative post. I love the photos - so much colour. Dry Tortugas is a place I have always wanted to visit...the history, the wildlife, the scenery...it looks so amazing. Thanks for sharing! I am a Miami native who now lives in San Diego... I used to spend a lot of time in the Keys and The Dry Tortugas is one of my favorite places on the planet. Thank you for such a great piece paying respect to this awesome piece of history! My husband and his daughters have never been and I cannot wait to get them down there. Thanks for the tip, too, regarding the Park Ranger badges. 14 year old bonus daughter may not be interested, but the eight year old will! Thanks again - and love the photos! Not sure what happened in my last post? My keyboard was possessed :) I was trying to say what a great read, and very educational! Heading to the Keys later this year, may have to checkout the Tortugas too. Just got back from a Miami to Keys road trip. Never been before, but Lord, we needed some sun. Loved the warm sun and warm people. Now I'll add the Dry Tortugas to the list because I can guarantee we'll be back again. Those anemones are SO cool. And all of the fish, turtles, and wildlife there is so amazing! Also...the fort! So elaborate and never even used! It would be fun to explore it for the day! I love seeing historical buildings like that. Stacey, that looks like a really amazing place to visit! I have made it to Key West, but I didn't know anything about the Dry Tortugas or Fort Jefferson, otherwise I would have certainly tried to go there. Loving all sorts of historical buildings, but especially old forts, this really would have been a place I wanted to see. It seems really crazy to build such a remote fort and the use as prison sounds almost more logical. How did they ever solve the problem of not having fresh water, do you happen to know? We love the National Parks and Dry Tortugas has been one of those we've heard and hoped to visit. What a great tour and read. I love all the fun facts you included. It's wonderful to know there's so much for the kids to do. We always learn a lot from the Junior Ranger Programs and like your kids, mine enjoy earning their badges. I'd love to see that fort! All I know about it is related to the Yellow Fever epidemic. But if I visited here I'm not sure I could resist the impulse to start pretending to be a pirate. Haah You can pretend to be a pirate while you there no one will mind! My kids were pirates, then soldiers, then underwater explorers ~ that what traveling is all about! Thank you for reading! I had planned to go to the Keys this April and the Dry Tortugas were high on the to do list. Unfortunately it's been postponed til next year (hopefully!) but really looking forward to getting out there – looks really fascinating, and love the colours of the water! Oh No well hopefully next year you will get a chance to go! Stay tuned I have some more Key West things to do coming up soon! We have explored about everything there is there and still keep going back for more! thank you for reading! Wonderful history and tour, also enjoyed the fun facts to! 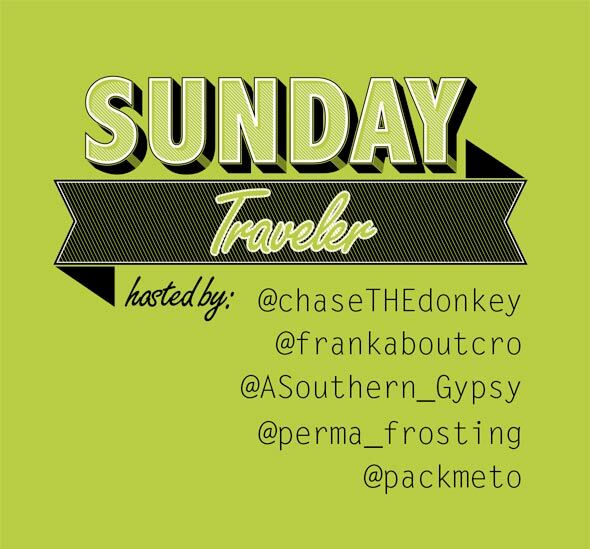 Hope you can also join us and link up for Travel Photo Mondays, the link is up all week long! Thank you for reading! Ok I will check it out Thank you for the invite! Yes, indeed, we enjoyed a lot our day in Dry Tortugas with you. Great post, Stacey! We've been many times in Key West, but unfortunately never made it to dry Tortugas. Now I feel sorry not to do it. What an amazing place. So tiny, but then again, such a rich fauna, interesting history and beautiful beaches. Thank you for reading I am so glad you enjoyed the story! Oh no ...well Next time you will have to make the trip, you will not be disappointed! Wow this looks like the best day out, cultural historical interest with snorkelling, beautiful beaches and cocktails on the boat home. How can you better that? I want to go NOW! Thanks for reading ~ you will love it, it is an amazing place! Thank you for stopping by! It is a really amazing place, my family loves it there! Next time you are in the Keys you will have to take the trip! haha My kids thought that keeping out the Pirate Ships were pretty cool too! Very cool post, I've been wanting to camp here for years but didn't have the time last time I went down through the Keys. Some great photos here...! Beautiful pictures - been to Key West but not here, wish we had gone there now, it looks amazing and really interesting! Thank you for stopping by! Oh well next time you visit you must take the trip out to the Dry Tortugas! It is an amazing place!